It's official; Apple's hosting an iPad unveiling extravaganza today, 364 days after last year's Cupertino tablet party. Here's what to expect from the new iPad and iPad Mini. And don't forget that we'll be covering Apple's iPad Keynote live in just a few hours. The event starts 10AM ET/1PM PT, but we'll get things started about an hour before. Follow along with us! Let's begin with the best-case scenario: Apple will announce the widely rumored iPad mini with a retina display. Reports that the 7.8-inch screen's resolution will double from 1024 × 768 on last year's model to 2048 x 1536 can be traced back to specs posted on the German blog Mobileaks. If we believe photos posted by Sonny Dickson, the new iPad mini 2 will be slightly slimmer than the already svelte original. And while there are no specific rumors along these lines, it would make sense for the camera to get a bump. Update: The WSJ is certain that Apple is "readying" a new iPad—but it doesn't say for sure that this is what the company will announce. A higher resolution iPad mini is coming sooner or later, but according to Reuters, supply chain issues might stand in the way of an iPad Mini with retina display before 2014. In that case, we'd expect to see at least some upgraded guts on the tiny tablet. Speaking of guts, it seems logical that since Apple has publicly begun its transition to 64-bit processor architecture with the iPhone 5S A7 system-on-chip, the company would start future-proofing its new iPad models as well. But don't forget that the original iPad Mini ran just an A5 processor. An upgrade all the way to A7 (or some new A7X), would be a huge jump. What's more, Apple might try a different SoC design since the A7's new M7 motion processor is less useful on an iPad than on an iPhone. Mobileaks seems to think it'll be the A6X SoC currently used on the iPad 4. As per Apple's custom, we'd expect the new iPad mini to be available for pre-order on the Friday after the announcement, October 25th. The official on-sale date should follow a week later on November 1st. Expect the same pricing as the original iPad Mini: Wi-Fi models for $330 (16 GB), $430 (32 GB), and $530 (64 GB). LTE models will likely cost $460, $560, and $660. We're going to get a new iPad at the iPad event because, duh. According to a video posted by Unbox Therapy (below), a supply chain report in the Wall Street Journal, and a detailed Sonny Dickson hands-on (above), a new iPad—the fifth generation flagship Apple tablet—will likely feature the first major hardware revision since the iPad 3 got a big heavy battery and a retina display back in 2012. The Unbox Therapy video suggests that while the iPad 5 will retain its 9.7-inch retina display, it'll have a narrower bezel, a lighter design, and an overall look resembling the iPad mini. The overall width of the tablet will be 1.5 cm thinner, according the video. An A7x processor would follow Apple's standard upgrade schedule, and you can expect a camera upgrade here as well. As with the mini, pre-orders for the iPad 5 will likely begin October 25th with the tablet hitting stores on November 1st. 16/32/64/128 GB Wi-Fi models should cost $500, $600, $700, and $800. LTE models models should cost $640, $730, $830, and $930. There's a possibility we're going to see an updated and expanded line of smart covers on Apple's large tablet. Apple's invitation to the keynote could be read to imply that we're going to get updated covers, and according to independent tech blogger Jamie Ryan, there's chatter about a new Surface-like smart cover. The WSJ is reporting that the iPad will switch from a glass to a new "film" material for the iPad's screen. NoWhereElse.fr posted images of what appears to be an iPad Mini with a fingerprint scanner like the one on the iPhone 5S, but this is hardly a given. A pretty shady image from CtechCN (below) appears to show the sensor on the full-size hardware as well. Logically, it would make sense for Apple to move forward with the technology, but there's no solid evidence. It's just as likely that Apple would want to keep Touch ID as an iPhone 5S exclusive. 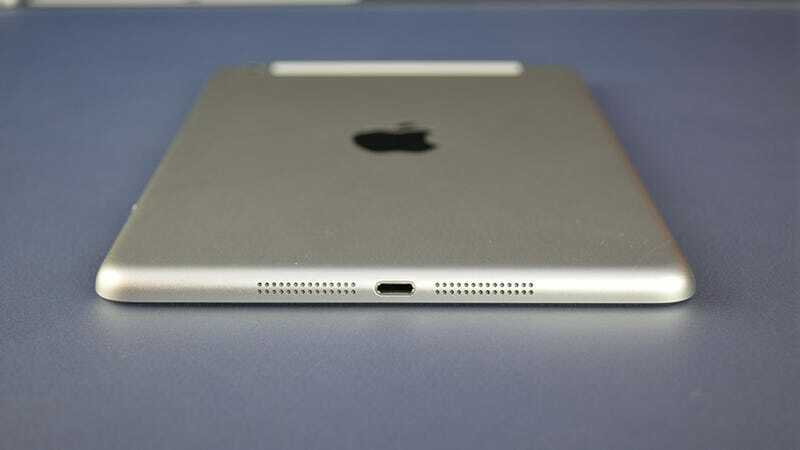 The iPads, like the iPhone 5S and iPod nano, will probably be available in a fancy Space Gray finish—at least according to images published by both Sonny Dickson and NoWhereElse.fr. The French site also has images of what it claims are gold models of the mini, although, given that Apple has faced supply chain issues with the gold iPhone 5S, the company might hold back. We can always dream.